I loved this because frankly it’s the truth, its true magazines, malls, media can all be a major influence in our society today, but truthfully the fight does not lie there alone, it lies in what WE CHOOSE to allow to enter our minds and hearts. If we have allowed God to transform our Minds, as Paul states, all of that will have no influence on us. If in our hearts and minds it is settled that we love God and want to please Him, then when magazines, media etc., tell us that immodesty is what is hip and new, we will not be moved, because we have made it up in our minds to serve Christ and anything that doesn't please him, suddenly disgusts us. I don’t know If you felt that way before, but when I see things that don’t please God, it just makes me want to run away, and not take part of those things, even if I didn’t initiate them! His love and his strength are our strength to not give in to the ways of this world. Some people say that what really matters is inside the heart and not how we dress outwardly, now this is a whole other post, which I will get too, but let me share a verses that goes to show that what is in our heart will truly show externally too. Of course, this verse it talking about Speaking, but it could also be applied to our conduct as a whole. If we have good treasure (God’s word) inside of us, than we will be a testimony to others of that by how we dress, speak and act. So doesn't it make the quote above make more sense that of what is in our heart we will dress on the outside?? If in our heart and minds and with our INTENTIONS we want to please God, we will dress accordingly, if we don’t, than we won’t. So I guess what I’m trying to say is yes, magazines, media, etc., have a big influence in our society today, but WE CAN MAKE THE CHOICE to choose Modesty instead of nakedness (which is what we see much of, especially during the heat season). If our heart is sensible to Gods word, we will see that his word bane’s nakedness! We will see that the ways, fashions of this world are not his ways. Our minds are renewed by HIM to not think anymore as was past, but to think in accordance to his Word. Examine the intentions and motivations of your heart for dressing the way you do, are they in accordance to God’s word or are you conforming to the World’s intentions (which are all sinful in nature; vanity, ostentatiousness, sexuality, lustfulness – temporary empty pleasures)? I encourage all of the newcomers to Christ to let the Lord work on your heart and mind to renew it each passing day, that we may never go back to our old ways and always seek HIS WAYS. That our hearts always be sensible to God’s word and to what he requires of us. It’s true, it’s not easy to have your mindset changed completely – when you’ve been living a certain way for so long, but just allow the Lord to do it, come to him with an open heart and he will do the rest. Let go and let God. 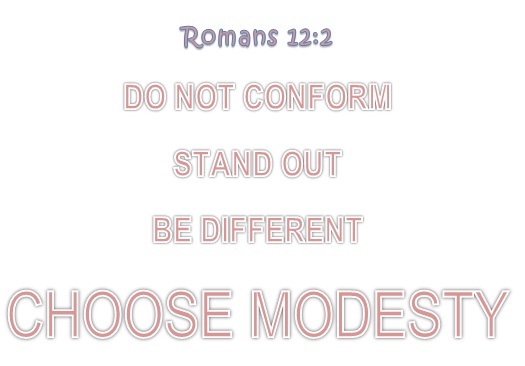 Do not be conformed to this World, Choose Modesty. That's right! Choices, choices, choices. We have to make sure that our choices are similar to His-choices. Too many people cry that modesty is too difficult, but it lies with one's choice. If you CHOOSE to WANT to have a modest way of life/thought/conduct/etc. it won't be difficult. Yeah, every now and then we'll moan that we can't find anything modest, but that's not really a problem. It's when we decide to let go of our personal convictions and standards for the sake of following what's popular that it becomes difficult to dress modestly. Anyway, I don't want to keep going! Keep up the good work! Love your comment! Thanks for the encouragement, I love your blog! Keep it up too.